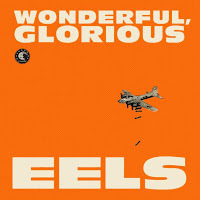 Over the course of the last few Eels releases I've begun to wonder whether the world really needed more from the band. Those albums were more introspective in nature (read: boring) and really just retrod Eels' already well-trodden ground. While there's not any new ground broken on their new album, Wonderful, Glorious (out Feb. 5th), there is a rekindled passion that comes blazing through. Most Eels albums have a cohesive sound that runs throughout. Be it quiet contemplation, aggressive groove, or cheeky indie pop, they more or less follow one course for a record. Not so this time as Wonderful, Glorious sees Eels touching on all of those in one place. Several cuts have a hard sound not heard since Souljacker. The guitars on "Kind Fuzzy" are just that. "Peach Blossom" bangs and clatters with a gritty stomp. The lead-off track "Bombs Away" is a smoldering statement. A psychedelic blues rock provides the oomph for "New Alphabet" and "Stick Together". There are still plenty of the more reflective tracks to be found. "Accident Prone" and "True Original" are melancholy and agonizingly slow-paced. Melody is key to the slightly twangy "On the Ropes". Complex and delicate orchestrals frame the personal lyrics of "The Turnaround". The finale title track boasts lovely harmonies that force their way in through a Clash-like funk bassline. Does the world really need another Eels album? The answer is still 'not particularly', however, maybe unlike any previous release Wonderful, Glorious, provides a good survey of the group's styles and marks a nice entry point for newcomers to the band. Eels play The Phoenix in Toronto on February 25th. Best tracks: "Kinda Fuzzy", "Stick Together"